The baking is a result of some booking; two girlfriends and I have an interstate (Iowa-Georgia-Texas) book group that we conduct via conference call and the books we read tend to relate to women and cooking. Our first pick, A Homemade Life by Molly Wizenberg was chock full of tempting recipes and I just got around to making the first, the Raspberry-Blueberry Pound Cake that was recommended by Jill of our book group. Indeed, the recipe did not disappointed. I basically followed the linked recipe except that I used frozen berries and cheap cherry brandy instead of kirsch. It turned out wonderfully and Austin keeps nibbling on it. What a neat idea for book club. How do you choose your books? 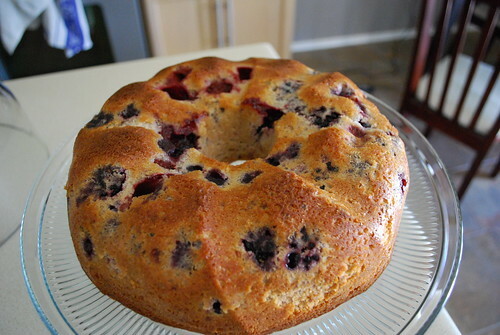 I need to buy a bundt cake pan.